It’s amazing how much faster time passes for kids than for adults. Somehow, when kids are asked to wait five minutes they think it’s been five minutes after only one. On the other hand, if they’re told that they can do something for just 10 more minutes, they’ll insist it’s only been five. When it comes to keeping teeth healthy, it’s important that we spend enough time covering every tooth surface and getting into every crevice to brush away the icky germs and bacteria that help form cavities. Dentists recommend brushing teeth for 60 seconds or longer, so for kids who have, let’s say…a poor sense of time, it’s not always guaranteed that they’ll brush as long as they should. 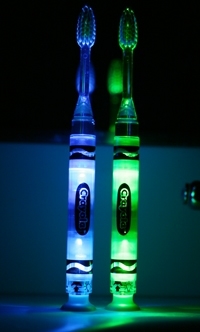 The new Gum Crayola Timer Light Toothbrush has a creative way to let the kids know how long they’re supposed to brush. The GUM Crayola Timer Light Toothbrush has a smaller, tapered brush head so it will be more comfortable and will fit into the kids’ smaller mouths, especially kids between 4-11 years old. 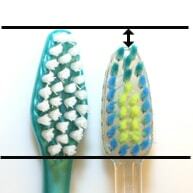 (The picture shows a side by side of the Crayola toothbrush head on the right next to a larger toothbrush.) The bristles are brightly colored green, blue, and yellow Dome Trim bristles, which helps remove plaque. They are also soft bristles so that they’re gentle on the gums and teeth (just in case the kids brush too hard. One feature I absolutely love is the rubbery, suction cup base. 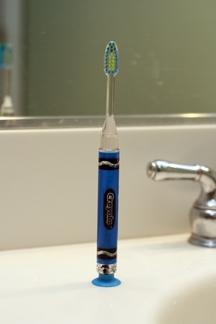 It allows you to stick the toothbrush to the counter, so it’s standing up vertically. Not only does this help keep the counter clear, but it also keeps the bristles in the air so they don’t pick up other dirty stuff (like soapy water from washing hands.) This feature is so cool, I don’t understand why every single toothbrush – including ones for adults – doesn’t have a suction cup on the end. 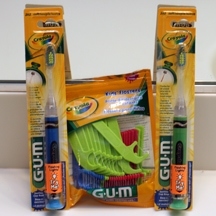 You can also try your hand in winning a special GUM brand prize package in the WCatDD Gum Crayola Toothbrush Giveaway! 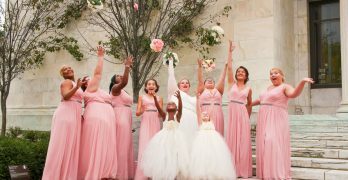 One winner will receive a Gum brand prize package including: TWO GUM Crayola Timer Light Toothbrushes, GUM Crayola Flossers (in berry, green, and blue), and for the adults – GUM Eez-Thru Mint Flossers and TWO GUM Technique+ Toothbrushes. THIS ENTRY IS REQUIRED FOR ALL OTHER ENTRIES TO BE VALID (+1): Visit gumbrand.com and tell me what other products you think you would like. Giveaway ends at 11:59 PM EST, December 17, 2009. Disclaimer: This post consists of my (and/or fellow tester) opinions only. No compensation was given for this review/giveaway. I did receive a free Gum Crayola Toothbrush Package from the manufacturer or the representing PR agency to use and test for the purposes of this review. 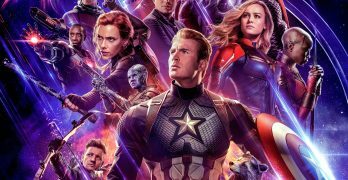 This did not affect the outcome of this review. GUM® Sesame Street™ Power Toothbrush is another product they have that I think would go over well. The Critters toothbrush is adorable.